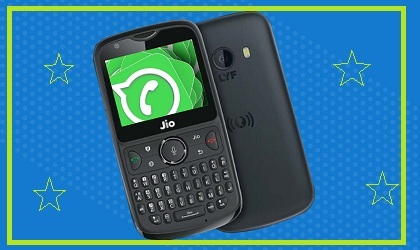 Now you can do Whatsapp with Reliance Jio phone and Jio phone 2, learn how to - Mobile-Centers: laptop reviews,smart phone reviews,camera review,latest technology news. Whats app has announced that their messaging app will now be available to all Jio phone users across the country. The company has actually created a new version of it which will work based on KaiOS operating system. In fact, jioffence has been given the KaiOS operating system, due to which the company had to prepare a new version of Whats app messaging for it. Along with this, the company has informed that this new app has become available from Jio phone App Store on September 10, 2018 and the company will release it for all Jio phone by September 20. Under this, users can download this app in their Jio phone or Jio phone 2 and download it through the download link provided by the App Store. This new version of Whats app comes with several special features that are already available in Android and iOS. For this, Whats App says that users can sand and receive text, photos and videos from this app in Jio phone and all these will be end-to-end encrypted, i.e. completely safe and do not have any third party access Can do. Apart from this, users can also send voice messages in it, for which only keypad will be required. In order to use this in their Jio phone, users will only need to first verify their phone number, after which they will be able to chat with other Whatsapp users or make personal chat. About this, Vice Daniels, Whatsapp Vice President, says, "Now millions of people in India will be able to use the Whatsapp Private Messaging app in their best-in-class Jio phone. After designing a new app for Kaios, we hope that communication between the people across the country will be easy and convenient. Along with this, JIO phobic users will also get the best messaging experience across the globe. "